Precipitate Reports Initial Results | Precipitate Gold Corp.
Vancouver, B.C. – January 18, 2017 - Precipitate Gold Corp. (the “Company” or “Precipitate”) (TSXV: PRG) is pleased to provide results of initial diamond drill holes from the ongoing Ginger Ridge drill program at its 100% owned Juan de Herrera project in the Dominican Republic. Results from the Phase 2 drill program at Ginger Ridge include analytical results from the initial five completed holes (GR16-07 to GR16-11) from this phase, totalling of 1,310 metres. Laboratory analytical results have been received for core samples collected in all holes, excluding the final 60 metres of Hole 11 which was paused for the holiday season break. Drilling of Hole 11 was recently completed and samples for the final meterage of that hole will be submitted shortly for laboratory analysis. 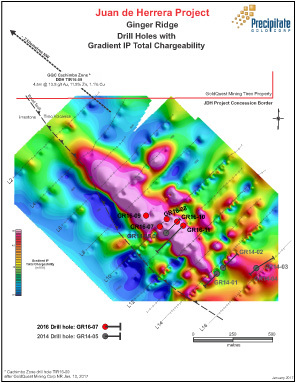 Holes 7 to 11 were collared up to 150 metres from the Company’s 2014 discovery hole (“Hole 5”), testing mineralization and alteration continuity and select discrete induced polarization (‘IP’) chargeability-high geophysical anomalies. The laboratory analytical results for samples collected in holes 7 to 11 (partial) are summarized below. See the accompanying drill-hole location map and the Company’s website (www.precipitategold.com) for additional compilation illustrations. All drill holes intersected andesitic volcanic rocks (mixed crystal, lapilli, lithic tuffs, fragmental and debris flows) which exhibit zones of weak to very strong chlorite-pyrite-silica (± clay) alteration, with some lengthy intervals (exceeding 15 metres in hole 10) of strongly disseminated to semi-massive very fine grain pyrite-silica mineralization. Holes 10 and 11 were drilled to the southwest direction at a shallow dip angle and successfully cut the main regional thrust fault which separates the Tireo volcanic rocks from younger limestone lithologies. Importantly, the andesitic volcanic rocks are variably altered and mineralized to the thrust contact. The Company is now compiling and reviewing all available data to guide the next tranche of drilling in this program, which will likely test a newly identified IP geophysical anomaly at depth in the north-central portion of the Ginger Ridge Zone. The increased depth extent of the IP anomaly was not known to the Company prior to the commencement of the current program and therefore represents a new expanded target for continued drilling. Core samples were collected under the supervision of Michael Moore, P.Geo. HQ, NTW and BTW diameter diamond core was descriptively logged on site, aligned, marked for sampling and then cut in half, longitudinally, using a rock saw. One-half of the core is preserved on site in core boxes for verification and future reference. Rock samples were bagged, sealed and delivered directly to Bureau Veritas (“BV”) preparation facility in Maimon Dominican Republic where they were dried, crushed and pulped. Sample pulps were then delivered to BV facilities in Vancouver British Columbia Canada for analyses (an ISO 9001 accredited facility). Samples were crushed to with more than 70% passing 2mm mesh and split using a riffle splitter (code PRP70-250). An approximately 250 gram sub-sample split was pulverized to minus 200 mesh (74μm). A 15 gram sub-split from the resulting pulp was then subjected to aqua regia digestion and multi-element ICP-ES/MS analysis (code AQ201) and an additional 30 gram pulp spilt subjected to fire assay for gold (ICP-ES finish) (code FA330-Au); samples with results with gold greater than 8 ppm were subjected to a second fire assay analysis and a gravimetric finish (30 g pulp; code FA530-Au). All coarse rejects and pulps are currently stored at BV. Certified standards and local limestone blanks were inserted into sample shipments as a quality control measure in addition to the internal quality control measures applied by the laboratory; comprising greater than 7% of the total sample volume.